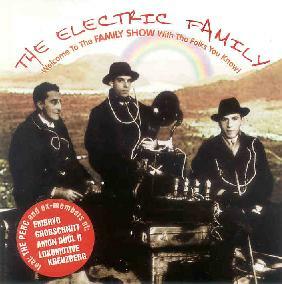 The Electric Family - "Family Show"
This is a group of old German freaks. The album was originally released in 1997. It appears here with two bonus tracks, one the A side of a vinyl single ("Seven Miles Overground") and the other ("Space Hymn") the music they used to open their shows on the tour in 1997. The core of the band is Tom "PERC" Redecker on vocals, piano, acoustic guitars and he is joined by Harry Payuta (bass) and Torsten Glade (Drums), none of whom played in the famous bands I listed above. At least 10 guests help out from the bands Embyro, Grobschnitt, and Amon Düül II, with extra percussion, keyboards, backing vocals, and guitar. "Roll Polly Roll" is an acoustic space song to open the CD. "Uranian Largess Done" begins with a spoken word piece that sounds like Johnny Cash speaking (it isn't!). Frazn Powalla plays some really nice electric leads. The same sort of spacey laid back groove as the first song are laid down. "The Racing Song" is a very American sounding acoustic country folk song. The highlights of the CD are the two long suites ("Space Caravan" and "Ariels Hyperdrive"). These are real space rock songs with a bit of Hawkwind mixed with the old Kraut rock sound. Excellent stuff. "Flesh To Sulphur" opens with a very Hawkwind inspired guitar riff but then it changes into something else. "Prayer" is the most upbeat song on the CD. "Pueblo Woman" starts with an American Indian tribal beat upon which vocals and acoustic guitar is layered on. Tammo Lüers plays some electric guitar on this song and "Prayer". "The Ariels Hyperdrive" suite closes the CD. Great Space rock stuff but I would have preferred a real drum track over the machine. The extra tracks, the first, "Seven Miles Underground", also had programmed drums. I really like the vocals of Tom. The Space Hymn is a nice piece of space music. I was really surprised at the enjoyment I received from hearing this CD. I have played it many times now and it is a excellent re-release and worth seeking out! For more information you visit http://www.shackmedia.com. Contact via snail mail c/o Shack Media; PO Box 1627; D-27706; Osterholz-Scharmbeck; Germany.